Horniman & Co was likely the largest tea firm in the world throughout much of the latter half of the nineteenth century. It was the first tea producer to package the product individually, at a time when tea was bought loose from a grocer. John Horniman (1804 – 1893) was a Quaker from Reading, England. The Horniman family had emigrated from Germany to Devon in the 15th century. Quakers often promoted products such as tea and confectionery as an alternative to alcohol and tobacco. Horniman had established himself as a tea dealer in Northampton by 1825. At this time, tea was a luxury good, mainly consumed by the rich. Tea consumption in England rose rapidly from the 1840s onwards. The business was based on the Isle of Wight by 1846. Horniman & Co was relocated to Philpot Lane in London in the late 1840s. The site was chosen due to its proximity to Mincing Lane, where tea auctions were held. The business had moved to Dalston Place by 1851. A warehouse was opened at Wormwood Street, nearby to Mincing Lane, in 1854. At the time, tea was sold loose by grocers. As such, it was frequently subject to adulteration by unscrupulous vendors. Horniman was the first to package his tea in individual packets by 1851. It was branded as Horniman’s Pure Tea. The influential Dr Arthur Hill Hassall (1817 – 1894) of The Lancet vouched for the purity of Horniman’s product in 1859. Theirs was the only Chinese green tea examined by The Lancet that was found to be free of added colouring, which was commonly used to disguise poor quality. The British government reduced the duty on tea in 1864. Horniman’s passed on the savings to the customer by lowering the price of their product. There were 2,280 outlets for their product by 1864. The Horniman & Co warehouse contained the largest stock of duty-paid tea in London in 1867. Over 12,000 sq ft of warehouse floorspace was constantly in use. John Horniman retired in 1869. His son, Frederick John Horniman (1835 – 1906), took over management of the firm. A dynamic man, Frederick was intelligent and likeable. 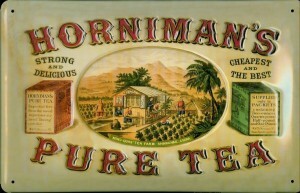 Horniman’s Pure Tea had a strong export market by 1876, with high sales in Europe. The success of the firm was built on a dedication to quality, keen prices and strong marketing. The tea warehouse on Wormwood Street burned down in 1879. The tea, on which duty had already been paid, was completely destroyed. The fire caused between £100,000 and £150,000 worth of damage (between around £11 million and £17 million in 2015 prices). Temporary premises were quickly arranged, and the firm was able to draw upon its tea reserves, so that only a few days of production were lost. A new six-storey warehouse was built on the same site in 1880. By this time the firm had an annual sale of over five million packets of tea, and 4,000 outlets. Previously the sole proprietor, Frederick Horniman took on his son, Emslie Horniman, as well as S R Brewerton and others as partners in 1889. Horniman & Co was the largest tea firm in the world by 1890. Tea packet labels were printed in nine different languages. Over 5,000 chests of tea, weighing 100lbs each, were exported each week. The founder, John Horniman, died in 1893. He had given generously to charitable causes throughout his life, but still left a personal estate of £320,000 (£37 million in 2015). His will donated much of his wealth to good causes. Rival manufacturer of packaged tea, Mazawattee, had decisively overtaken Horniman in sales by 1892. Horniman & Co sold ten million packets of tea annually by 1893. Tea was sourced from India, China and Ceylon, and only the young spring growths were used. To house the artefacts he had amassed during his travels around the world, Frederick Horniman opened the Horniman Museum in Forest Hill, London, in 1890. He donated the museum to the public in 1901, and it remains a leading London attraction. 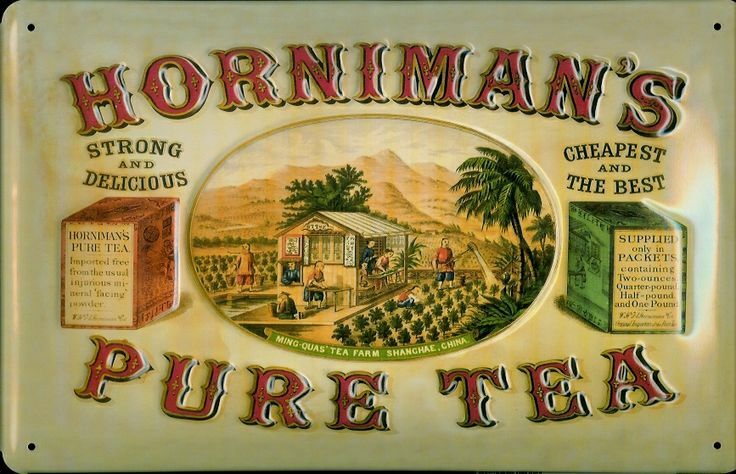 Horniman tea was sold through over 10,000 outlets by 1903. Frederick Horniman died in 1906 with an estate valued at £421,628. The business was taken over by his son, Emslie John Horniman (1863 – 1932). Horniman & Co was acquired by J Lyons & Co, the leader in the packet tea market, in 1918 . Lyons wished to build their tea sales in the North of England, where Horniman was strong. Lyons opened the largest tea packing factory in the world at Greenford on the outskirts of London in 1920. Emslie John Horniman died in 1932 with an estate valued at £317,605. Horniman was marketed as the Lyons premium tea brand by the 1970s. It was their highest seller in South Wales. However the brand was eventually withdrawn from sale in Britain. The brand is now owned worldwide by Douwe Egberts. In Spain, Hornimans leads the hot tea market with a 25 percent share. It is also available in Spanish-speaking South American markets. In Italy, Royal Tea traces its origins to Horniman & Co. Wonderful article. I am researching the life of my great grandfather who was born in Camberwell and ‘clerk to a tea merchant’. He was later clerk and manager of a bank in Croydon, so Horniman’s seems to be a possibilty. I would like to discover which bank dealt with the Horniman’s accounts. Horniman’s story demonstrates the fact that better quality results in lower costs, more customers and higher profits. Mr Horniman put the manufacturers of fraudulent “tea” out of business.